The Summer of 2014 will long be remembered for the gorgeous, sunny weather and despite a lull in August that weather is continuing through September. I thought last weekend may have been our last rays of sunshine but the brilliant weather has continued all week and today has been blessed with blue skies and bright sunshine. Its regatta and marathon weekend so hopefully conditions will stay good for all those visiting for these sporting celebrations. Today’s title refers to what I presume was some type of kite flying in the sky this afternoon. It reminded me of the furry snakes you get on a stick but on a much bigger scale. 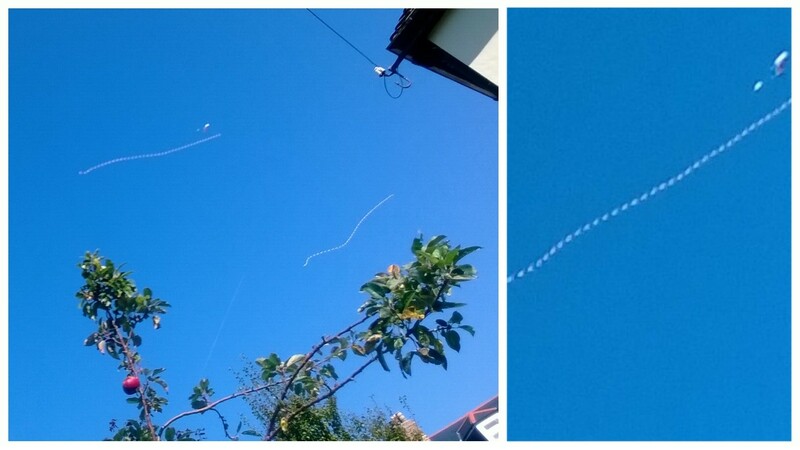 The photos don’t reflect the scale of the kite, it did look like two giant snake slithering in the sky. It was also beautifully coloured and against the perfect blue sky was stunning. I have done a quick search on Twitter and the web but have not found any reference to it, I am intrigued so will keep searching! This weekend we have a visit from Grandad so all of us went to pick up the children at school, it was lovely to see the children’s excitement at spotting Grandad and running up to give him big cuddles and kisses. Needless to say two little children were clutching his hands on the walk home. With such a delightful afternoon, we spent it in the garden, playing on the swings and slide and lots of cricket practice. Little man adores cricket and is happy to play for hours, bowling, batting and fielding. He did hit some lovely shots tonight, although is very dramatic in his diving catches. Daddy decided to spice things up by pouring water on the slide thus speeding up the journey down to squeals and excited cries. Daddy is always fun Daddy in the garden and it invariably involves water, lots of it and very wet but happy children. Today was no different and a great way to end the first school week of the year.